February 19 is the 75th anniversary of the signing of Executive Order 9066 by President Franklin Roosevelt. It was the start of a nightmare for Japanese Americans who were rounded up and placed in internment camps during World War II. How did it happen? And could it happen again to another group? 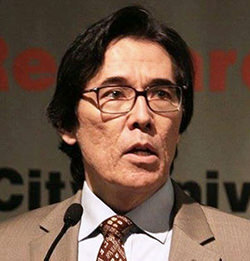 Phil Tajitsu Nash is an Asian American history professor at the University of Maryland, a civil rights lawyer, and a board member of the Asian American Legal Defense and Education Fund.He talks about how Roosevelt came to sign Executive Order 9066, despite information that should have negated any sense that Japanese Americans represented a threat.He also talks about how the internment personally impacted his family. You can also read about civil rights icon Fred Korematsu on the AALDEF blog: “In a Trump era, Fred Korematsu matters more today than ever” (2017) and “Happy FK Day! For Fred Korematsu, of course” (2015), and “Why we all must remember Fred T. Korematsu (2011).